In 2001, a preliminary study, undertaken by Marjan Research and associates, was sponsored by the CELT Corporation (the California Extremely Large Telescope, the predecessor organization to the TMT project) to design and build a prototype (P0) for the TMT primary mirror segment actuators. The design of the TMT PMA second prototype (P1) essentially inherited the proven concepts found in P0. There were a number of substantial design improvements made since the P0 design that were incorporated in the new PMA and that were aimed at further reducing weight, cost and complexity while maintaining the high performance levels demanded by the TMT requirements. Like its predecessors this design is characterized as a “soft” actuator. This means that the position of the actuator is enforced by a controlled, electro-magnetically produced force as opposed to imposing position with a ball and screw system. The earlier version (P1) was developed and tested in 2006 with good success. From the lesson learned with this actuator, improvements were made that resulted in the P2 actuator design. To evaluate the performance of the new design, a proof-of-concept actuator was built (hereafter denoted as P2A). 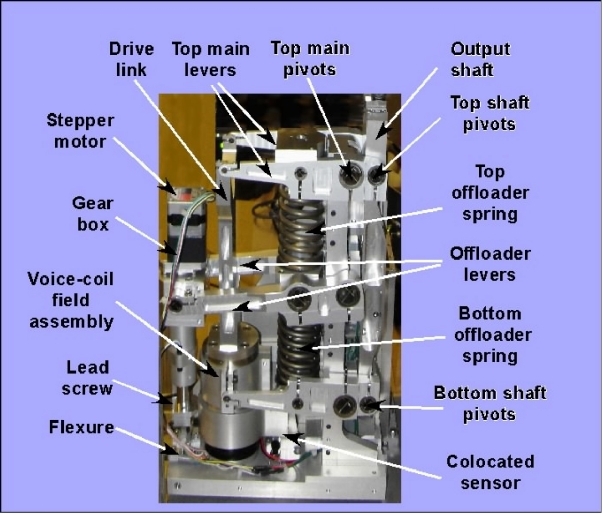 2) The voice-coil actuator no longer directly acting on the output shaft, but through a 5/1 lever, a feature that reduces power consumption and significantly improves the natural damping of the system. 3) The offloader mechanism uses a combination of stepper motor, gear-box, lead screw and lever, resulting in a very robust and extremely smooth operations. 4) The motion sensor has been moved to the actuator side to take advantage of collocation, improving control stability and resolution. 2- Supporting the variable apparent weight of the mirror as the telescope attitude is changing. 2- the offloading loop, that essentially controls the weight by winding or unwinding a spring in parallel with the voice-coil actuator. The electronics is implemented in a single Printed Circuit board. This board, the PC104 and various power supplies are all integrated in a single electronic enclosure (EE). The whole control console is shown in figure 2. 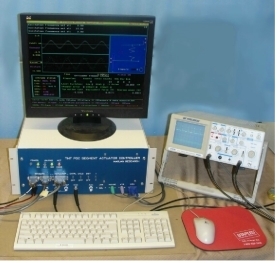 Monitoring analog signals are available that can be displayed on a regular oscilloscope.